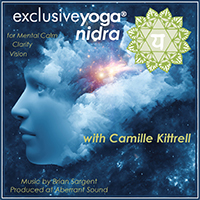 World-renowned yoga therapist Camille Kittrell guides you on an inner journey to enhance positive thinking, calm focus, and creative vision. Uniquely eloquent. Blissfully hypnotic. Deeply restful. Chair of Brandeis Univ. Music Dept. Whether your goal is to re-establish wellness, find peace of mind, or simply stay fit, Camille welcomes you to her web site and hopes to see you at Exclusive Yoga.